For a hot-rolled CHS, use buckling curve a (Table 6.5 (Table 6.2 of EN 1993-1-1)). For curve buckling curve a, a = 0.21 (Table 6.4 (Table 6.1 of EN 1993-1-1)). The chosen cross-section, 244.5 x 10 CHS, in grade S275 steel is acceptable. Laterally unrestrained beams subjected to bending about their major axis have to be checked for lateral torsional buckling (as well as for cross-sectional resistance), in accordance with Clause 6.3.2 clause 6.3.2. As described in Section 6.2.5 of this guide, there are a number of common situations where lateral torsional buckling need not be considered, and member strengths may be assessed on the basis of the in-plane cross-sectional strength. • The primary method adopts the lateral torsional buckling curves given by equations Clause 6.3.2.2 (6.56) and (6.57), and is set out in clause 6.3.2.2 (general case) and clause 6.3.2.3 (for Clause 6.3.2.3 rolled sections and equivalent welded sections). This method is discussed later in this section of the guide. 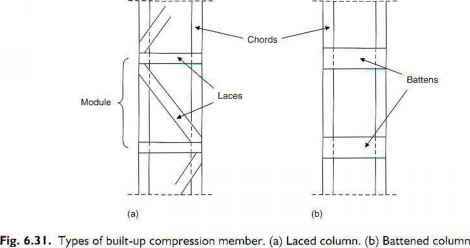 • The second is a simplified assessment method for beams with restraints in buildings, and Clause 6.3.2.4 is set out in clause 6.3.2.4. This method is discussed later in this section of the guide. • The third is a general method for lateral and lateral torsional buckling of structural Clause 6.3.4 components, given in clause 6.3.4 and discussed in the corresponding section of this guide. Designers familiar with BS 5950 will be accustomed to simplified calculations, where determination of the elastic critical moment for lateral torsional buckling Mcr is aided, for example, by inclusion of the geometric quantities V and V in section tables. Such simplifications do not appear in the primary Eurocode method; calculation of Mtr is discussed later in this section of the cuide. Clause 6.3.2.1 (2) Clause 6.3.2.1(2) deems that'beams with sufficient lateral restraint to the compression flange are not susceptible to lateral torsional buckling', though there is little guidance on what is to be regarded as 'sufficient'. Annex BB offers some guidance on the level of lateral restraint that may be provided by trapezoidal sheeting;^lw;ar BB is discussed in Chapter 11 of this guide. The design bending moment is denoted by MEli (bending moment design effect), and the lateral torsional buckling resistance by Mb Rd (buckling resistance moment). Clearly. MUl3 must be shown to be less than Mb Rd, and checks should be carried out on all unrestrained segments of beams (between the points where lateral restraint exists).
.'Ml where Wv is the section modulus appropriate for the classification of the cross-section, as given below. In determining Wy, no account need be taken for fastener holes at the beam ends. \LT is the reduction factor for lateral torsional buckling. From equation (6.55), a clear analogy between the treatment of the buckling of bending members and the buckling of compression members can be seen. In both cases, the buckling resistance comprises a reduction factor (\ for compression; ylt 'or bending) multiplied by the cross-section strength (AfyhMl for compression; Wyfyhm for bending). The lateral torsional buckling curves defined by EN 1993-1-1 are equivalent to (but not the same as) those set out in BS 5950: Part 1 in tabular form in Tables 16 and 17. Eurocode 3 provides four lateral torsional buckling curves (selected on the basis of the overall hcight-to-width ratio of the cross-scction, the type of cross-section and whether the cross-section is rolled or welded), whereas BS 5950 offers only two curves (only making a distinction between rolled and welded sections). Eurocode 3 defines lateral torsional buckling curvcs for two cases: the general case (clause 6.3.2.2) • rolled sections or equivalent welded sections (clause 6.3.2.3). Clause 6.3.2.2, the general case, may be applied to all common section types, including rolled sections, but, unlike clause 6.3.2.3, it may also be applied outside the standard range of rolled sections. For example, it may be applied to plate girders (of larger dimensions than standard rolled sections) and to castellated and cellular beams.